Nearly forty-eight percent of the American population suffers from sleep deprivation, according to a report. What’s worse is that more than half of them do not take any action to improve their sleep. Often, you don’t have to make big changes to improve sleep. Small changes, for instance a new pillow, can make a huge difference. Check out the section below to learn which pillow types are good for back sleepers. You might also want to see our review of 5 best pillows for back sleepers if you’ve decided to get yourself a new pillow. At one point or another in our life, most of us experience sleep issues—and that’s ok. But not doing anything about it is not ok, because sleep deprivation affects both our physical and mental health. The longer you sleep poorly, the greater its negative effect. A good pillow can improve your sleep and provide relief from neck, shoulder, and back pain. Still, if you really want to get a handle on your sleeping posture, you need a good pillow. And with so many different types of pillows available, how does one choose the best pillow for back sleeping? Back sleepers should opt for a pillow with medium firmness. Such a pillow offers good support and keeps the head and spine aligned. A very thick pillow is a no-no for back sleepers, for it will throw the head forward, resulting in a stiff neck in the morning. If you sleep on the back and have back pain, you would benefit from a pillow underneath your legs as well, as it helps in reducing the pressure on the spine and maintaining alignment. You can also use a rolled blanket to the same effect. What are the different pillow types? There are many different types of pillow filling materials, each with unique features. Here’s a brief description about each, along with their pros and cons. These pillows contain buckwheat hulls. Buckwheat is a plant cultivated mainly for its grain-like seeds and its hulls has been used as a pillow stuffing for many years. Pros – These pillows fits the contours of the body very well and so are able to provide good support. As it is made of natural stuff, it might be a good choice for those who like eco-friendly products. Other benefits include durable, adjustable, and airy. Cons – The hulls inside rustle as you move. If you are a light sleeper, you might find the noise disturbing. They are also a little expensive than some other types. Developed by NASA in 1960s, memory foam has become a popular pillow and mattress material in last couple of decades. Pros – It is known for its ability to reduce those unwanted pressure points and provide great support. It is a good option for someone with back, shoulder, or neck pain. These pillows last for many years and are naturally hypoallergenic. Cons – Great as memory foam is, it is not everybody’s cup of tea. Getting used to it takes some time, and some just don’t ever adjust to its firmness. Poor air flow and a strong smell when new are other two turn-offs. These pillows are stuffed with especially soft feathers, called down feathers, found below the outer layer of larger feathers of geese and ducks. Most down pillows contain both down and regular feathers, usual composition being 75% down and 25% feathers. Pros – They are soft—and people love them for it. Down pillows are also very light, airy, and easy to mold. They also last for many years. Cons – Down pillows do not offer a lot of height or support. Some back sleepers might find a down pillow too soft. Allergy sufferers should stay away from them. In place of down, gel fibers or polyester puff is used in this type—that’s the only difference. Pros – The down Alternative Pillows offer all the benefits of the down pillow and one more: it is safe for allergy sufferers. Cons – You can expect the same drawbacks as the down pillow. This is another popular choice among all types of sleepers. These pillows also go by other names, like hollowfibre pillows or microfiber pillows. Pros – These pillows are relatively cheap, soft, huggable, and lightweight. They are naturally hypoallergenic, so asthma sufferers can use them. Not noisy and easy to care are its other advantages. Cons – They are a good—but only for a short while. Polyester pillows have the shortest lifespan, from 6 months to 2 years. They can also get out of shape quite quickly. Another good option for back sleepers is water pillows. Most of these pillows come with a polyester microfiber layer on the top and a water pouch below it. Pros – You can customize support, firmness, and height by increasing or decreasing the water content. This quality helps provide better relief from pain. Water pillows also breathe much better than fiber pillows. Cons – The water pillow is on the heavy side because of the water content. It might also make noise (courtesy water content, again) when you toss and turn. They also cost more than others. This pillow is thin. And that’s its biggest advantage, for there are not many really thin pillows. Even many ‘thin’ pillows are not low-profile enough. But with only 2.75 inch thickness, this one is. It also is very soft. 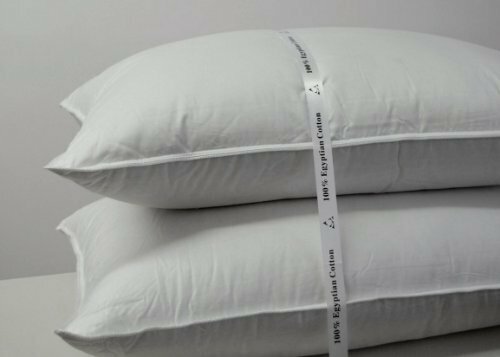 As the pillow is made from 100% latex, it is naturally hypoallergenic, dust mite and mildew resistant, antimicrobial, and antifungal. Asthma sufferers and allergy sufferers can use it safely. The pillow also stays cool throughout the night, so you don’t have to worry about waking up in the night because of the warmness under the head. The outer cover is made of cotton and is comfortable and washable. Just zip it off whenever you think it requires a washing. If you are a stomach sleeper, looking for a pillow that is soft, supportive and thin, while ensuring your head doesn’t touch the mattress, you might want to give the Slim Sleeper Pillow a try. The pillow offers the superior support of memory foam and luxurious softness of fiberfill. You get good support for your neck and head on the memory foam side. The down-like fiber fill, on the other hand, cradles your head softy. However, those who prefer flat pillows might not be very happy as the pillow does not flatten out like a down pillow. Memory foam used in this of open-cell technology and, because of that, it breathes better. You are not likely to become warm under the head as the night progresses. And, of course, if you do, you can always use the down-like fiberfill side. The pillow cover is machine washable and made of cotton. Removing and putting it back on is easy and simple. The memory foam used is made in the USA, although it is not Certipur-US certified. Those who have a strong liking towards products made in the country might want to consider this pillow seriously. The Royal Hotel Goose Down Pillow is not too firm. Nor is it too soft. It is about the right firmness level and gives great support. It might be an excellent choice with people with neck or back pain. The pillow doesn’t become flat during the night, ensuring your head does not sink too deeply into it, which can throw off the alignment. While the pillow is made of 100% goose down feathers, it is also hypoallergenic. There are not many hypoallergenic goose down pillows. If you are prone to allergies but like the plush softness of goose down, you might want to give this pillow a try. Sometimes quills can poke you through the cover of goose down pillows. However, I didn’t have any such issue with this pillow. There is no formal warranty, and that’s a minor disappointment. You can only dry-clean the pillow. The pillow provides good support to the head and the neck. Its neck bump keeps its shape well. However, some users might want the pillow a little too squishy. The pillow stays cool all night long. Even after placing your own thin flannel pillow case, you would find the pillow stays refreshingly cool. 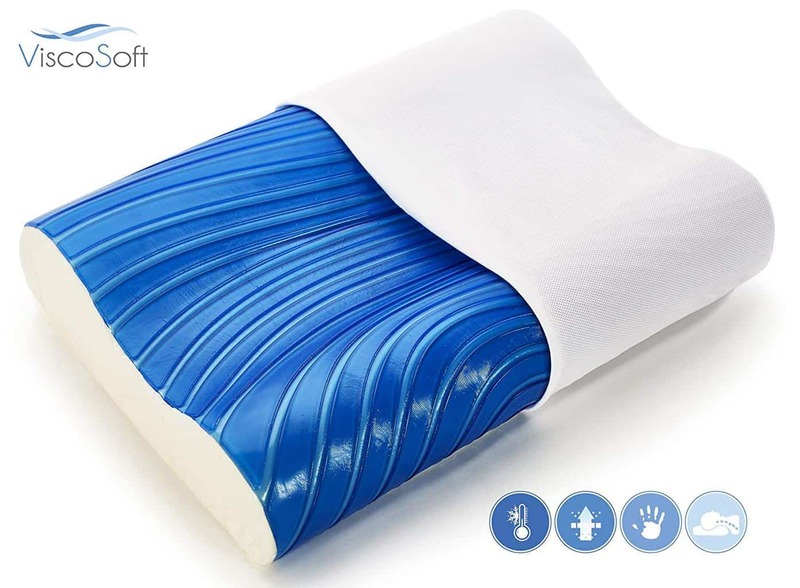 The pillow is suitable for those who have asthma or are prone to allergy as it uses memory which is naturally hypoallergenic and dust mite resistant. The pillow doesn’t come with any sort of warranty. Another disadvantage, especially if you only buy certified foam, is that it doesn’t carry a Certipur-US certified seal. The smell is rather too strong and stays even after you’ve aired it out for a few days. You might have to live with the smell for a couple of weeks or perhaps more. A room freshener, like white vinegar, might help dissipate the odor more quickly and is worth a try. The pillow is comfy and soft but not so much that you feel the head sinking down too deeply. It provides good support to the head and the neck. The pillow features a zippered cover, which is another positive. You won’t have to struggle even a bit while taking it off and putting it back on. 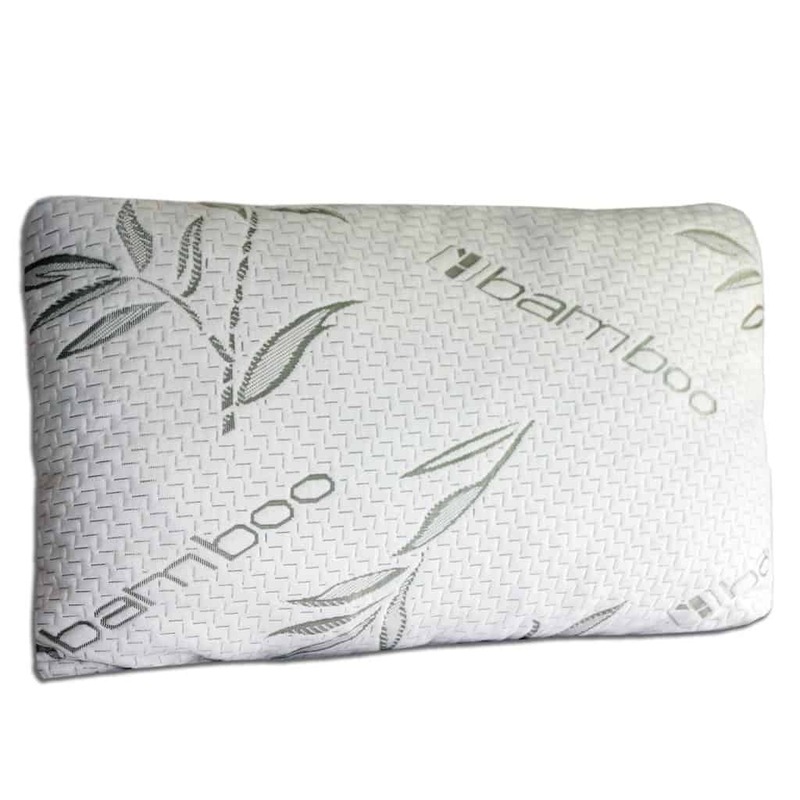 As the pillow cover has a healthy amount of bamboo in it, you’ll the cover soft and breathable. Oh, and did I mention the pillow comes with, not a 5-year or 10-year, but a lifetime warranty? Yes, it does—and there aren’t many like this. My only gripe is that the pillow is a little too bulky and sometimes feels a little hot under the head. All in all, it is a good pillow for back sleepers. Plus, it is made in the USA. If that is important for you, you might want to give this pillow a try.